It was back on January 7th in 2006 that the worlds first Sonic podcast was launched. Yet 2,995 days (just over 8 years) later, the final ever episode aired and the doors closed on Radio Redux. This isn’t the first time a Sonic podcast has switched off the audible lights. In fact, the list is longer than you probably realise, so why go to the effort of writing about this one? Radio Redux means a LOT to me, it pre-dates The Sonic Show by less than a year and was a large inspiration to me. Sonic Wrecks (the website that created the show) was a big deal. I looked up to people like Kevin (Radio Redux host) like idols of the internet. They were the first place in the community to acknowledge The Sonic Show when it began it’s life on iTunes as a video podcast. And you can not begin to imagine how crazy it was to hear the one and only Kevin Eva [ArchangelUK/AAUK] mention us! We later collaborated together on a crossover episode between both shows and a friendship grew. I’m very proud to still call Kevin a good friend to this day infact! As the years have passed, both our shows have evolved. 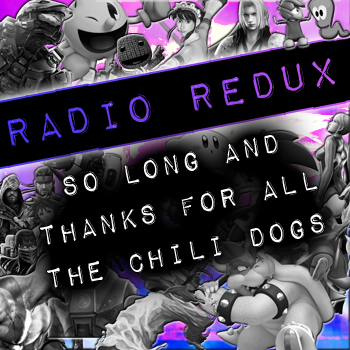 Radio Redux moving to a live format then branching out beyond SEGA, The Sonic Show moving from long format video podcasts to short form Youtube videos, but I still felt a link to this show. Have I listened to every episode of Radio Redux in the past years? No. But I doubt K/evin and his crew have watched every single thing I’ve done either. The point was this show was the last link to why I am part of the Sonic community. When I started as a nobody the sites I visted were places like Sonic Cage Dome, Sonic Wrecks and Sonic Yoda. These sites were either places I looked up to, or places that grew as I did. Radio Redux was the biggest symbol of this. With the exception of The Sonic Stadium, the Sonic community I knew and understood is gone. Radio Redux closing, the show that I identify with in terms of starting a show and growing an audience is over, leaves me feeling one thing. Mournful. Of course the people I respect from the sites of old are still friends IRL, but it does make you realise that as a show that started 7 years ago, you look around at your peers, and they are all new faces. It’s weird, should I congratulate myself for standing the test of time? For being able to stay “sort of ” relevant and maintain peoples interest? I remember this site. I remember coming here to read the comics and enjoy the changeable background. Time has seriously jet packed its way out of here. But its good to look back 🙂 Thanks for the site. This was special to me.